Christmas and Holiday Events Around Tacoma and the South Sound for 2015. Holiday events for kids and families around the South Sound. This list has all kinds of events, mostly one or two day happenings. If you’ve looking specifically for a Santa breakfast, a holiday show, a Nutcracker, or a tree farm, we have separate guides to those we’ve linked to at the bottom of this post! As always, while we strive for 100% accuracy, we’ve also provided links so you can double check event details before you head out! Below, you’ll find tree lightings, Santa visits, Santa breakfasts, parades, ice skating, gingerbread house making, and more! Events are listed by geographical area and ordered by date. Shop, dine, and play in downtown starting with Small Business Saturday at 10 a.m. Enjoy music, snacks and kid activities in the Event Pavilion Center, 3-7 p.m. Tree lighting and Santa arrives at Piazza Park at 5 p.m.
November 30 through January 1, 5:00 p.m. to 9:00 p.m..
Start your holiday season off at Gene Coulon Memorial Beach Park, with an evening of entertainment, holiday spirit, and stunning visual effects. A fun event for young and old alike. This event draws thousands of spectators each year. Join Destination Des Moines and our sponsors for this annual family event in Des Moines. Caroling, live music, face painting & photos with Santa. Kent – Saturday, December 1, 2:00 pm – 7:00 pm. Winterfest in Kent with live entertainment from local musicians, story time at the library, and free hot cocoa, cider and popcorn! Santa arrives at 5 pm for the tree lighting and other festivities. Photo opportunities —bring your camera! December 6th, 5:30–7:30 pm Come join Mrs. Claus and Special Guests for cookie decorating, beverages, holiday music, photo booth opportunities and fun! This is a great way to make holiday cookies and leave the mess to us. Auburn Santa Parade and Tree Lighting – Saturday, December 1st, 4:30 pm. A family event celebrating the season with a Santa parade, community caroling and commencing with the lighting of the Christmas tree at Auburn City Hall. Great, family event with fun all day! Auburn Santa Breakfast – Santa Breakfast, Saturday, December 8th. Two separate seatings at 8:30 am and 11:00 am. Little ones can tell Santa what they want for Christmas, enjoy a pancake breakfast, and entertainment. Tickets are $8-$10. The largest holiday drive-through display in the Northwest, featuring nearly 300 elaborate displays and thousands of sparkling lights. The beautiful two-mile drive along Spanaway Lake has become a memorable lakeside tradition for the entire family. Fantasy Lights will operate every night including Christmas and New Year’s Day, from 5:30 p.m. to 9 p.m.
Tacoma Tree Lighting at the Pantages Theater – Saturday, November 24, 5:30 pm. Join the community for the 73rd Annual Holiday Tree Lighting. Gather for carols and photos with Santa! Carols first, followed by tree lighting. Puyallup, A Simple Wish – November 23, 7-8:30. This is a paid show; tickets are $20.00. Enjoy refreshments and photos with Santa and the princesses after. Your favorite princesses will once again be hosting our popular Tree Lighting Ceremony! Performance will be held on November 23rd from 7:00 to 8:30 pm. Following the show, delightful refreshments will be available along with picture opportunities with the princesses and Santa Claus. Tickets will be on sale for $20.00 per person, and are sure to run out quickly – so order yours today! Reindeer at Watson’s Nursery, Puyallup – Ongoing! Donner and Blitzen are spending their holiday vacation at Watson’s ’til December 24th! Free Santa visits select weekends Free! Santa will be making his Friday visits to the store soon! Visiting Santa is free of charge. I believe it’s a Bring Your Own Camera opportunity. PLEASE KEEP IN MIND, SANTA NEEDS TO BE BACK TO HIS SLEIGH DAILY BY 4! To accommodate, we will have to cut the line off. In previous years, we have had to do this as early as 1 o’clock. Please be prepared for a longer wait time, as Santa likes to spend quality time with each and every child. As always, the photos are complimentary. We are accepting food and monetary donations to benefit the Sumner Food Bank. Your generosity is greatly appreciated! Zoolights, Tacoma – November 23th-January 6th, 5:00 pm – 9:00 pm. Explore over half a million lights at the zoo, take a camel ride or get warm in the South Pacific Aquarium. Northwest Santa – Northwest Santa will come to your home, take a photo, hear children’s Christmas wishes, and even give a gift. Last year registration for this free, in home Santa experience started on Black Friday. Stay tuned to the Northwest Santa Facebook page for details. North Pole at the Fair, Puyallup – Reserve a photo time with Santa and enjoy a full afternoon at the North Pole, with an entire village just for kids. You can also buy tickets just to play at the Pole if you don’t need or want a photo-new this year is the “Season Pass,” option! Get a reservation now for early season/midweek discounts. Victorian Country Christmas, Puyallup Fairgrounds November 28th – December 2nd. Holiday fun for all ages! Over 500 stores, dining, concerts, stage shows, Santa and much more! University Place Tree Lighting – Friday, December 7th, 4 pm – 7:30 pm. Tree Lighting and festivities. Lakewood – Saturday, December 8 Day-Long Holiday Event – Tree lighting, parade & fun with Santa! Run in the Jingle Bell Rock 5K and 1-Mile Fun Run, find one-of-a-kind gifts at the Candy Cane Lane Holiday Market and Craft Fair, visit with Santa & participate in the parade by building a float, singing, dancing or decorating a car. End your evening with the Annual Christmas Tree Lighting in front of Lakewood City Hall. Event admission is $8-$10, and children 3 and younger are free. For more information call (253) 404-3970. Tree Lighting in Milton – Saturday, December 8th, 3 pm – 8 pm, Milton City Hall. Santa, crafts, snacks, tree lighting and much more! Old Town Tacoma – Saturday, December 8, Santa visits the Job Carr Cabin Museum. 1 pm – 3:30 pm. Santa Visits Old Town is a FREE family-friendly event. We invite the community to celebrate the season at Tacoma’s birthplace. Our cozy cabin fireplace is the perfect setting for your keepsake Santa picture! Bring the whole family and make a memory. Performances, crafts, treats, and free photos. Join us for this much anticipated visit from Santa and his reindeer friends. Memorialize the holidays in the beauty of the Conservatory with a professional photograph with Santa for $15. cookies, crafts and and jolly good times provided. Puyallup Main Street – Saturday, December 1st, 5:00 pm. Bring the kids down to welcome Santa! See the jolly old elf arrive on one of Puyallup’s finest fire engines! Included in the festivities is the Holiday Market (12:00 p.m. – 7:00 p.m.) in the Pioneer Park Pavilion and the lighting of the Community Tree in the Pioneer Park! This wonderful community tradition is a great way to kick off the holiday season! The City of Bonney Lake and the Kiwanis Club are again sponsoring annual holiday Tree Lighting and Food Drive activities! Come join the fun! Activities and music, refreshments, candy, pictures with Santa, and the annual tree lighting ceremony. Drop food donations off at the Food Bank, which is adjacent to the Public Safety Building and the community Christmas Tree. Santa trades in his sleigh for a fire truck! Come celebrate the season with the Mayor and Santa as they use some holiday magic to light up the trees outside of City hall. Free photos with Santa, cookies/hot cocoa. Santa and Mrs. Claus invite you to breakfast. Kids will create a holiday craft and share their Christmas wish list with Santa. Children must attend with a parent or responsible adult. Bring your camera for a picture with Santa. Breakfast will be served from 9:15-10:15 a.m. Note from SFM: See our other guides for info on Fife Santa runs with the fire and police departments and the Fife area Nutcracker. Hour long program with traditional Swedish song, dance, and a children’s performance. $5 general admission, reception to follow. Living historians will present a period candle-light Christmas in the remaining officers’ quarters. The gift shop will also be open for Christmas shopping. Tickets will be available at the Fort Steilacoom Interpretive Center in Quarters 4 during the event, 4 to 7:30 p.m. Adults $5, children $3, family $10 (parents & kids). Frolic and folly at our annual Victorian Holiday Festival honoring Tacoma’s historic Victorian-styled Conservatory. Staff and volunteers will be dressed in beautiful costumes. Enjoy live music, crafts and delightful refreshments. $3 suggested donation. 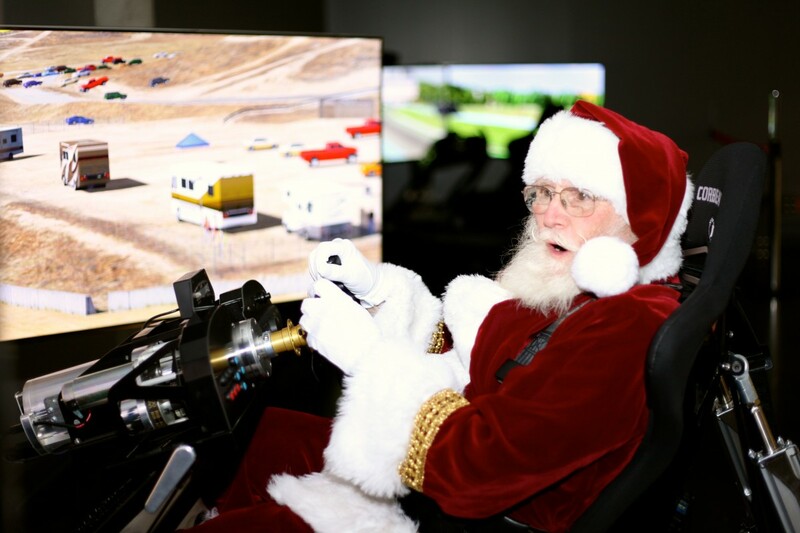 Santa is driving in to ACM this holiday season to upgrade his ride! Join Santa for a photo op in a 1906 Cadillac Model K Tulip Touring Car. Kids receive a free slot car voucher for the ACM Speed Zone! Santa photos are FREE for ACM Members or included with ACM admission as a digital download. Brown’s Point Bonfire and Caroling Date TBA! If you are interested in this, keep an eye on their website for the date announcement. Join Bonnie Beaudoin in the tropical atmosphere of the Conservatory for storytelling along with a short hands-on art project. Kids will have fun learning about nature and plants through stories and crafts. Suggested donation $3. Join in a sing along at the festive Conservatory at Wright Park, 6 pm – 8 pm. Bring the family and enjoy a hot cocoa bar and caroling at the Conservatory. $3 suggested donation. Elves and Bells Around Town, Steilacoom – Friday, December 14th, 5 pm – 8:30 pm. Santa, Mrs. Claus, Rudolph, Frosty and the elves parade through Steilacoom before stopping at Saltar’s Elementary School. Gingerbread House Making at Pierce County Libraries Various dates and times from December 2nd-17th. Many that require registration are full, but check yours. There are also several drop in locations. These are FREE, and you can attend an event at any library; it doesn’t have to be the one nearest you. Puppets Please Holiday Show – Various locations, December 8-22nd. These colorful marionettes will be touring throughout the Pierce County Library System to bring you a holiday themed in the round show for all ages! All ages, drop in event. Readers have enjoyed this in the past! Jingle Bell Run – Tacoma December 24, 10:00 am or 12:00 pm start time. A refreshing 3 mile run or walk through Wright Park. Winter Wildland at NW Trek December 29-30, 930 am – 3 pm. Watch animals enjoy special themed enrichment treats and activities; included with admission. NW Trek is pricey; SFM recommends investing in an annual pass if you’d go more than twice this year. First Night in Tacoma – December 31. A family-friendly, arts-centered, alcohol free celebration of New Year’s Eve that takes place throughout the Downtown Tacoma theater district. Purchase buttons for admission to activities. Polar Bear Plunge – Tuesday, January 1, 11:30 am and 12:00 pm – FREE. If you’re daring, take a plunge in the Puget Sound on New Year’s Day at the Pt Defiance Marina boat launch. There will be heaters and free hot drinks following the plunge. Gig Harbor’s Annual Holiday Tree Lighting is the official kickoff to the holidays in Gig Harbor. Come join friends and neighbors for entertainment galore, including live music, Rainier’s Rhubarb, refreshments and a visit from Santa on the fire truck! Gig Harbor Pen Met Parks Breakfast with Santa – Saturday, December 1, 9:00 am- 11:00 am. Enjoy a pancake breakfast with Santa, holiday crafts, entertainment, and more! Tickets are $8/person. Pre-register online. Fox Island Tree Lighting – Sunday, December 2nd. Enjoy a holiday concert and Christmas tree lightning. Use link to navigate to the date on the calendar. TideFest – Gig Harbor High School; Saturday/Sunday, December 1-2. Fine arts and gifts festival. Pictures with Santa at the Log Cabin Museum – Port Orchard; December 1/2 and 8/9. Have your photo taken with Santa and the vintage Christmas tree at the Log Cabin. Donations accepted. Letters to Santa – Key Center Fire Department; Sunday, December 2, 3 pm -4 pm. Free community event! Letters to Santa is hosted by Key Pen Parks and the Key Center Fire Department. It is held at the Key Center Fire Station, 8911 Key Peninsula Highway KP N, Lakebay, WA 98349. Kids may come and decorate a cookie and write their letters to Santa! This is a great place to come before heading over to the KC Corral for the Christmas tree lighting ceremony. Celebrate Gig Harbor’s Scandinavian heritage at Harbor History Museum’s 5th Annual Light Up the Night festivities. Crafts, games, and traditional Scandinavian snacks are the star at this family-friendly event. $2 admission for all ages. Tickets can be purchased online at the Harbor History Museum’s Buy Tickets page beginning November 14, or at the front desk. For more information contact Zachary Sokolik, Marketing and Events Coordinator at 253.858.6722 ext. 5 or marketing@harborhistorymuseum.org. Lighted Boat Parade – Gig Harbor; Saturday, December 8, 5 pm – 9 pm. A parade of lighted boats from Arabella’s to the public dock. Menorah Lighting at Uptown Tuesday, December 4th, 6:30 pm. NOTICE >> Due to a construction project, Discovery Baptist will not be having a 2018 Living Nativity. Check back next year to see their new campus in 2019! Opens November 25th! This is a private home that goes all out with lights and opens their yard up for the community to walk through! The lights will be on 4:45 – 10:30 pm, November 25, 2018 through the New Year. Visitors are encouraged to bring donations for the Thurston County Food Bank (cash, check to TCFB, or non-perishable food). Providence Christmas Forest – Olympia Providence Christmas Forest 2018 public viewing will be held December 1-2, 9 am – 5 pm at the Hotel RL by Red Lion (2300 Evergreen Park Dr SW) in Olympia. The Tumwater Christmas Tree Lighting Festival is held each year on the 2nd Saturday in December, from 2:00 to 5:00 p.m., at the Tumwater City Hall & Headquarters Fire Station. This popular holiday event includes games, holiday crafts, performances by local and school choirs, and of course, the lighting of the tree. Santa will arrive on an antique fire truck after the ceremonial tree lighting to share his joyful laugh and spread some holiday cheer. Join us at this special event; you are sure to have a festive time! Thanks! We’ll get it added! Bahaha never mind! I totally didn’t see how you organized the list by county…. sorry about that! Mommy moment! No worries! You scared me for a minute, though-lol. My kids are always in that parade with their Scout troop. I’m hoping it will be a little warmer this year. Crosses fingers!! Also there’s the annual Festival of Lessons and Carols at the U of Puget Sound. Sunday 12/8, 7 pm, free (food donations accepted for local food banks). Features performances by Adelphian Concert Choir. Your listing says the Polar Express will show at the Grand on 12/21, but their site says the movie on the 21st is How the Grinch Stole Christmas. Yep. Polar Express was last year. I need to update that. Thanks! NW Trek is in Eatonville not Enumclaw, right? Ack! Yes! I am always mixing those two, up! Thank you! I didn’t see it listed, but the new bass pro shop in Tacoma has the santa land event, i think it’s every day, with specialty events and give aways on the weekends. We did have that listed in our free Santa photo guide, but you’re right that it should probably be here, too! Thanks for stopping by! Thanks, Maureen! I’ll look into it! I really appreciate the tips! ManeStage Theater in Sumner has The Christmas Story for Dec 2015. I am not sure all of the details but I know it is a few weekends in December. We just went to this today and it was so fun! They are open tomorrow 11-3.